Minister of Natural Resources, Raphael Trotman on Thursday cautioned against releasing details of oil exploration and production contracts because of the likely implications this may have for addressing border claims by Suriname and Venezuela. “Government, at this point in time, is of the view that full disclosure would not be to the national benefit or the national interest,” he told a breakfast engagement with the media held at Herdmanston Lodge, Queenstown, Georgetown. The Minister of Natural Resources, who holds a Master of Arts Degree in International Relations (Security & Development Economics) from the Fletcher School of Law & Diplomacy at the United States-based Tufts University, said he would personally advise against full disclosure at this critical juncture. 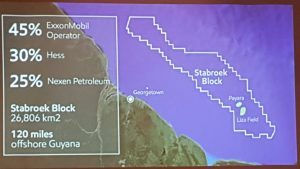 Trotman, however, said the Guyana government would be willing to disclose important aspects of the Production Sharing Agreement with American oil giant ExxonMobil which plans to begin commercial oil production at the Stabroek Block located more than 100 miles offshore. “Right now, we are prepared to share the salient features of the contract,” said the minister who is also the holder of a Post Graduate Certificate in Defence Planning & Resource Management from the United States National Defense University. He explained that it is a 50-50 Production Sharing Agreement, with provision being made to recover the cost of finding and exploiting the reservoir. “We are already wealthy. We are going to be wealthy. We have no reason right now to expose all our business to the world,” he said. The Minister said government declined to reopen the agreement in its entirety for negotiations to avoid Guyana being labelled as a country that does not recognise the sanctity of contracts. “It was not altogether a bad contract,” he said, adding that Guyana would in the future seek to negotiate better terms.